Soft fluffy cupcakes with that amusement park cinnamon sugary, crispy flavor. 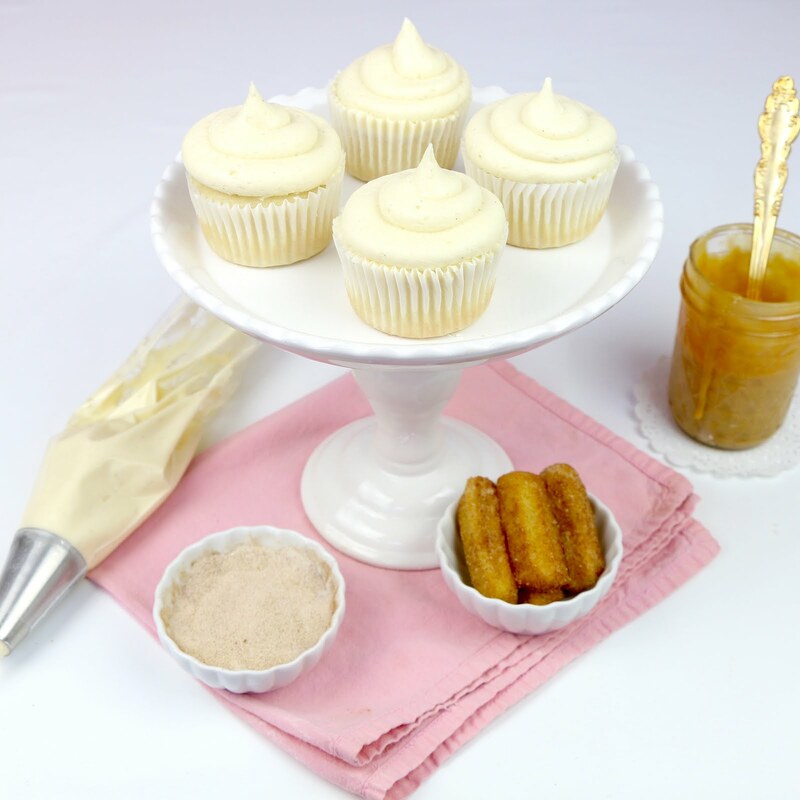 All topped off with a swirl of cinnamon spiced sweet frosting, dulce de leche drizzle and a homemade churro! 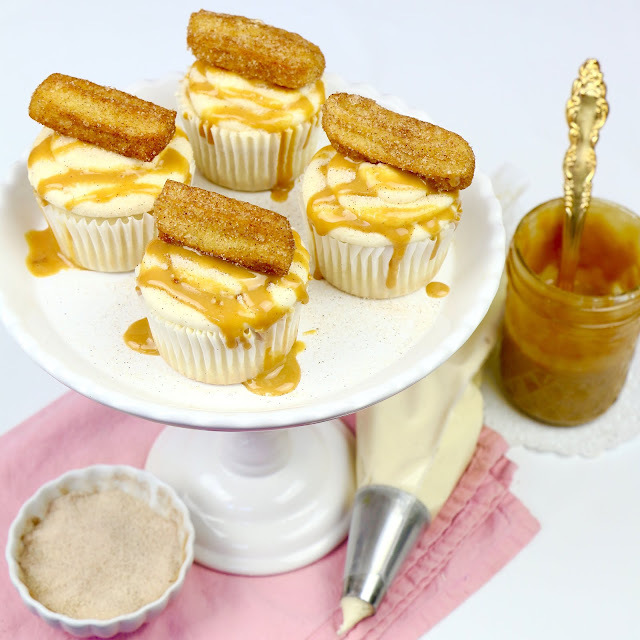 After all of the requests for my churro cupcake recipe, here it is! 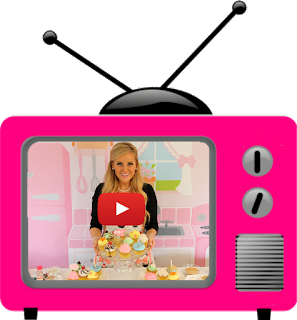 My famous cupcakes from my WIN on the series premiere of the Food Network's "Cupcake Wars". 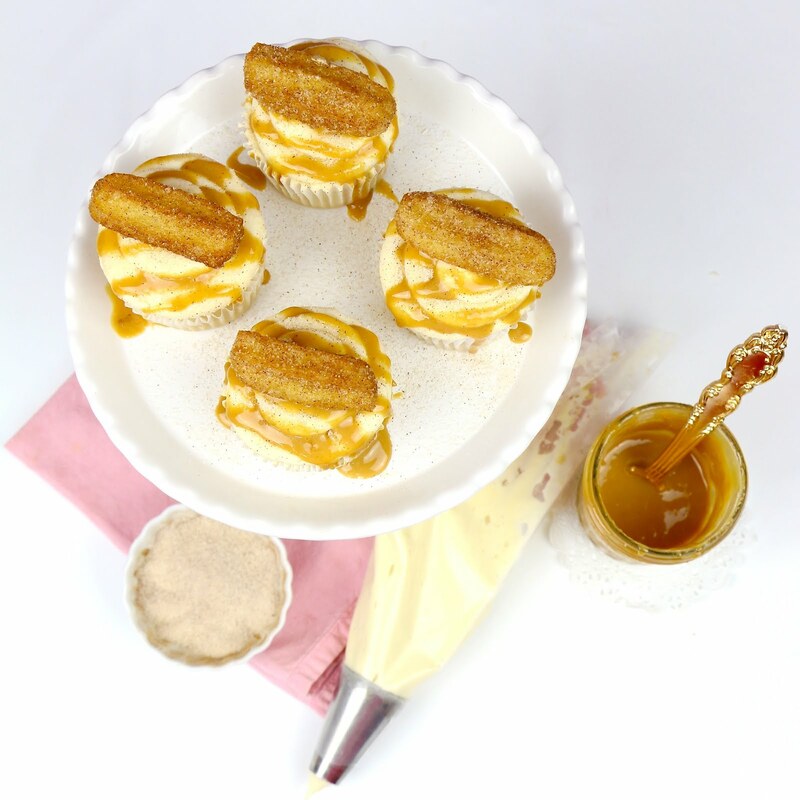 The cupcakes are moist and packed with warm cinnamon flavor. 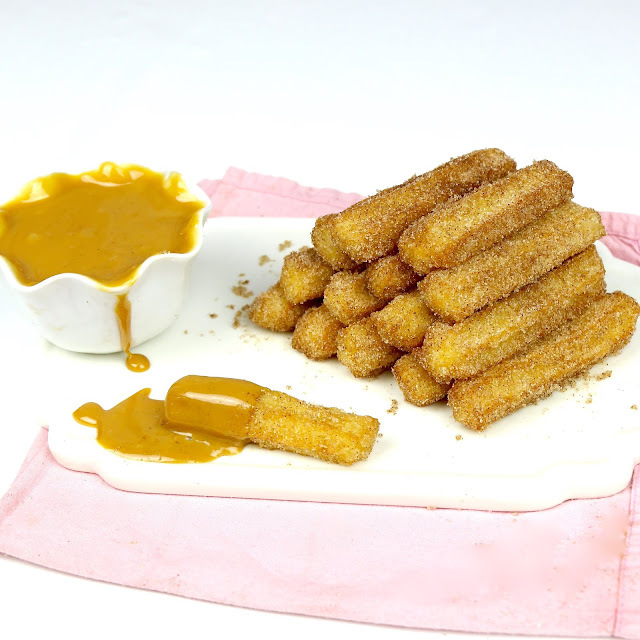 They are topped with the most creamy dreamy cream cheese frosting and sprinkled with cinnamon sugar, just like a churro. Some easy dulce de leche to finish them off and a little churro to complete the look for the best cinco de mayo cupcakes ever! 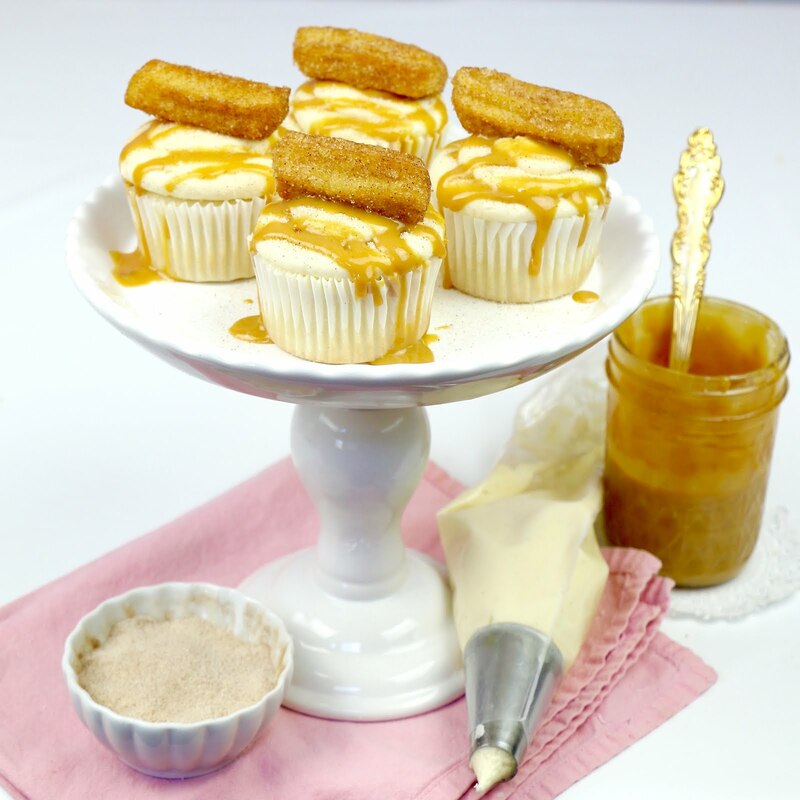 You can use store bought churros and dulce de leche, but my recipes are so easy and deliscious, you've got to give them a try! Preheat oven to 350° F (175° C). Line a cupcake pan with baking cups. In a medium bowl or bowl of a stand mixer, mix together cake flour, graham cracker crumbs, sugar, cinnamon, baking powder, baking soda, and salt on low speed for about 20 seconds. Add butter and oil and mix for about 1-2 minutes to coat the flour, until mixture resembles wet sand. 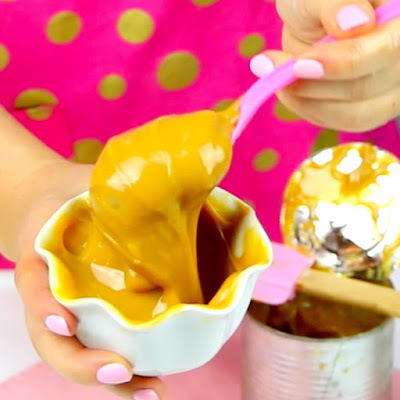 In a small bowl, whisk together egg, yolk, vanilla, and sour cream until smooth. Slowly add the wet mixture on low speed. Increase to medium speed and beat for about 1 minute until batter is smooth. 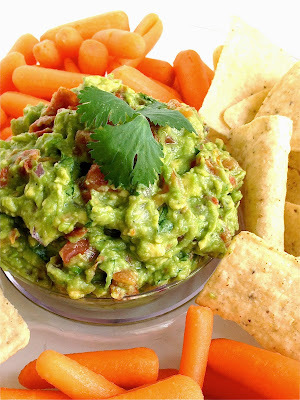 With an electric mixer, beat butter on medium speed until smooth and pale in color. Beat in cream cheese (make sure they are both at room temperature so you do not get lumps in your frosting). Add vanilla, cinnamon and salt. Gradually beat in powdered sugar until incorporated. Beat on medium speed for about 3 minutes, until smooth and creamy. Frost cooled cupcakes and roll in cinnamon sugar. Top with a Homemade Churro Bite! 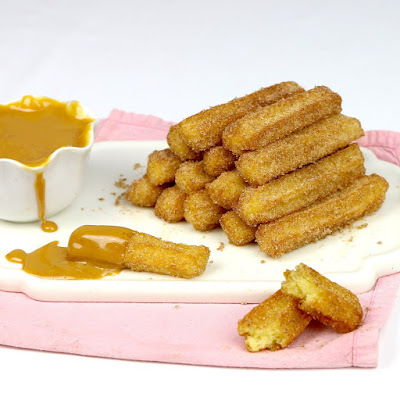 (Note: If using churro bites, make sure to serve immediately so the churros are crisp and fresh and don't get soggy from sitting on the frosting). 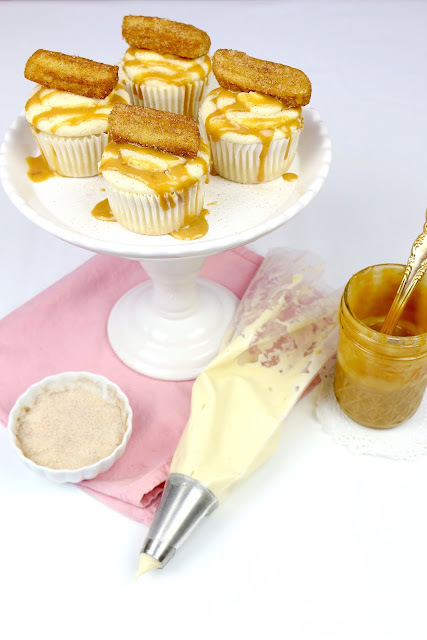 You can even leave out the dulce de leche for a simple, classic look. 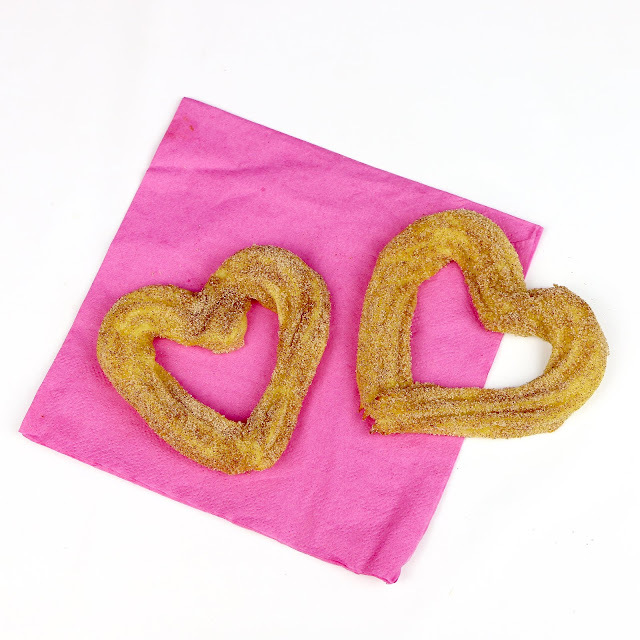 Create custom shaped churros like my churro hearts! 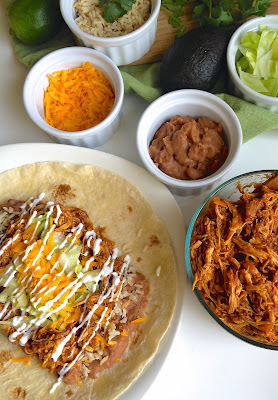 Want more for a complete Mexican feast? !